I just recently read an amazing article on Gizmodo.com which discusses the dramatic impact that photography had on the civil rights movement, specifically in the Project C protests in Birmingham, AL in 1963. Please read this article, as it addresses the overwhelming influence of the photographs portraying the despicable treatment of African-Americans in the streets of Birmingham. I look at this article and make many comparisons toward recent events and/or social conflicts that I have lived through. For instance, the Coup De Tat of 2006 in Thailand, the hidden societal slandering of the Chinese government of the 50th anniversary of the Tibetan uprising, and the violent protests of Bangkok in 2010. 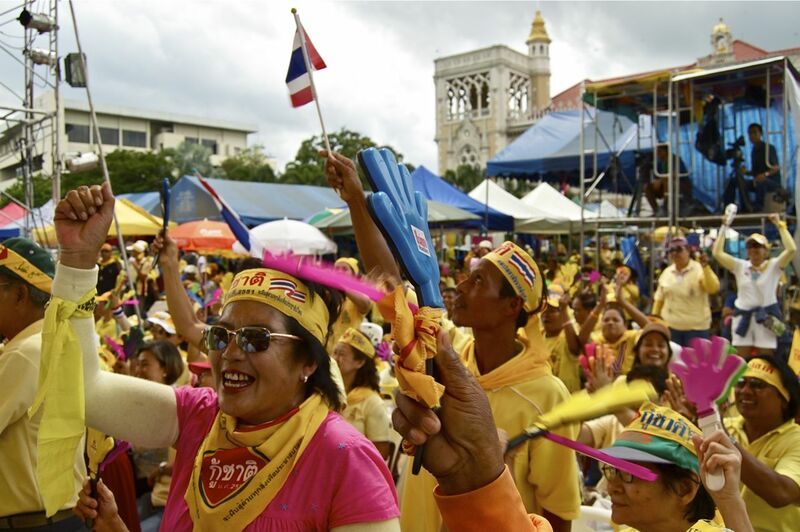 Thai, "Yellow shirt", protestors take over the Government House in downtown Bangkok, Thailand in August, 2008. The affect of today's technology has obviously played incredible roles in all of these issues, with Twitter, Facebook and other social networks being the face of modernized uprisings and protests (as seen in Egypt, Tunisia, and Libya). So much so that even one Egyptian man named his newborn daughter "Facebook" after its largely influential impact on democratic overthrowing of Hosni Mumbarak just a few weeks ago. But what has remained constant, over time, through struggle and discourse, is the element of images. Whether they are moving or still, colored or gray-scaled, focused or blurred, being able to capture the essence of a society, emotion, movement, or event is something any photographer strives for. The beauty of capturing significant moments in time can only be as valuable as to document that moment accurately, justly, and appropriately. To skew a reader/viewer toward your bias or perspective is what some say is the right of every artist. But in a time of important change or struggle, say within a country's political system like Egypt's, putting your own spin on the situation is disgraceful. I mention the Egyptian revolution specifically as my friend, Ghazala, has recently taken what is said in Gizmodo's article on the impact of photography during the civil rights movement and morphed it with the modern-day necessity of technology. Ghazala, a former fellow teacher of English in Thailand with me, has recently moved to Cairo for graduate studies. Upon arriving, the push for a change in power within the country occurred right before her eyes. And just like she did in Thailand during the protests of downtown Bangkok, she went into the heart of it like a good journalist would do -- not to mention a courageous journalist. And with risk comes reward. After snapping hundreds and hundreds of amazing images. Instead of concealing them for her own portfolio, she announced them with backstories and details into every incredible moment on Facebook and Twitter. Without bias, without prejudgement, but allowing for the photos to speak for themselves. With excellent photos comes emotion and reaction and that is precisely what happened with Ghazala's work. She was constantly on Facebook updating statuses and photographs, and on Twitter communicating with every person she knew about the crisis in Egypt but also informing the world of a fellow young adults view of the action. There were no CNN reporters standing on pedestals in front of crowds dressed in newly pressed shirts or even video of the chants echoing from Tahrir Square, but rather just raw images of struggle and hardship, all for one cause -- freedom. After a few days, Ghazala's images reached a larger scale than her Twitter followers, but the Al Jazeera network, then featured in photography blogs, then publishing companies, then Egyptian individuals that simply want to document this revolution accurately for their children. The work of an inspired individual, foreign to the country, has passed inspiration to others, by being able to capture change and emotion. You may not know Charles Moore of the Black Star who has many important photographs during the Project C protests in Birmingham in 1963, and perhaps you may never had the privilege to know Ghazala Irshad, but there work and their freeze frames in time -- in history -- is what you will remember. That's the beauty of a photographer. Being behind the camera may seem less glamorous to some than to me be in front of it, but all is relative. In a world where images of people are absorbed in and spit out by the hundreds a minutes, with advertisements and "famous" celebrities providing eye stimuli, the genuine nature of good images by a talented photographer is what matters in history. Fame may make the front page of newspapers and the back page of high school yearbooks, but photography makes all of the pages in history books. Because when all else fails, when news networks can't get there, writers lose their words, and stories become misconstrued, truthful, compelling images will always prevail. 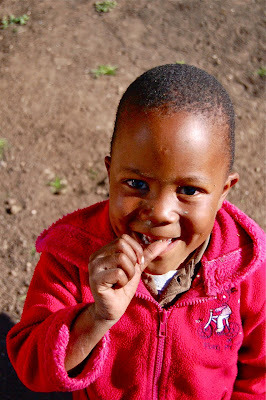 It is custom in Lesotho that when a visitor comes to your home that you have something to offer them, most commonly something to eat. It is there way of welcoming the person into their home. Hospitality is something the Basotho people know very well. I traveled to Lesotho to visit a friend of mine in the Peace Corps. Her name is Meg and she was located very close to the border to South Africa in a town called Butha-Buthe. 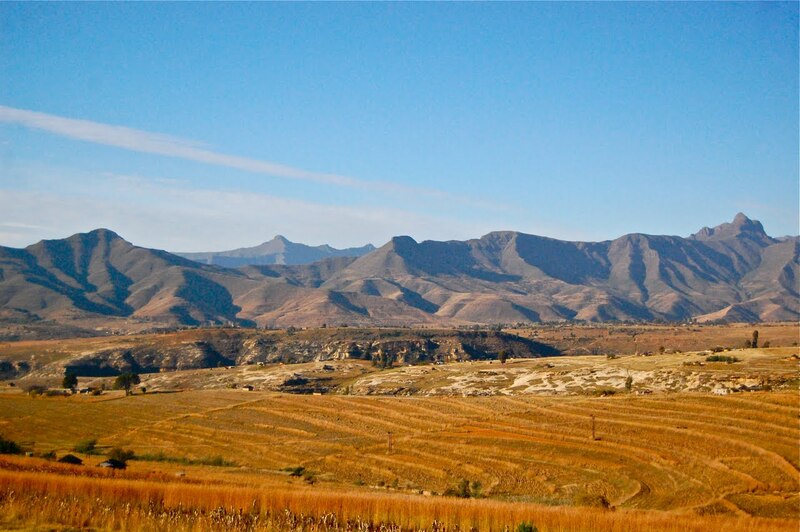 By looking a map you'd see that Lesotho is a landlocked country and enclave, about the size of Maryland, so you'd think that any town must be near the border of South Africa, it's physically overbearing neighbor to all sides. 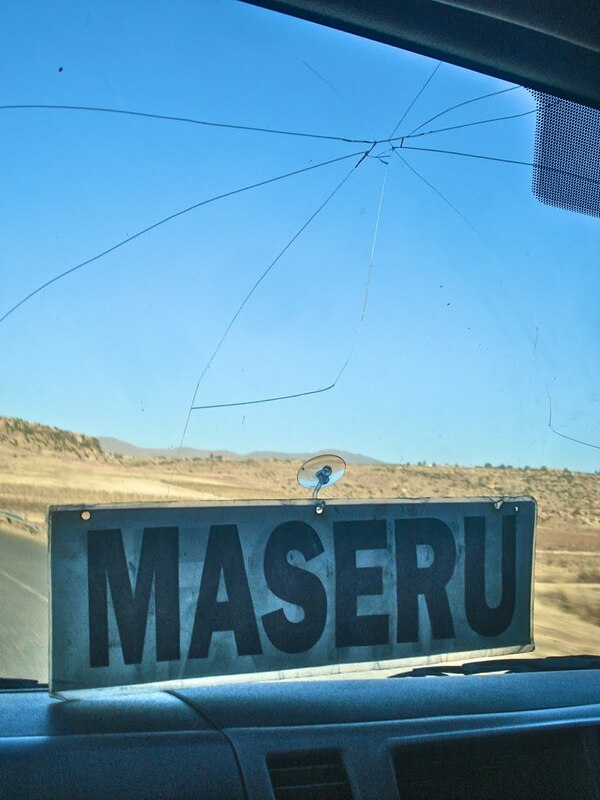 But what Lesotho has inside of it is deceivingly fascinating. It is the only country in the entire world that every inch is 1000 meters above sea level or higher, not even the “Rooftop of the World” Nepal can claim such a title. So with such high elevation comes stronger winds, colder temperatures, and in general a slightly more difficult lifestyle to cope with. But the Basotho people do it well. Upon arriving into Lesotho, I had quite a hectic journey just to make it onto the continent of Africa for my four weeks in South Africa and Lesotho. Because of many factors happening in Bangkok at the time, leaving my house to get a taxi to the airport was more challenging than ever before. Protests downtown caused a state of emergency with curfew set at 10 pm, my flight was at 10:45pm. Torrential rain flooded my neighborhood and continued to come down as I stood out in the rain trying to hail ANY car I could see. And lastly, without prior notice my flight was moved to departure 30 minutes earlier. So after pleading, begging, and then giving up, I missed my flight. I had to wait two more days, pay a fine as my work visa expired the original date of departure, and worst of all, miss two precise days in our world's most unique continent. The trip got worse. My time with my friend Meg was cut short, extremely short. I spent enough time at her home in Butha-Buthe to snap some photos, eat some shakalaka, be given the gracious gift of a traditional Basotho name by her “mme”, give some house warming presents, and then be sent on my way. Now a country that small in size, it should not be too difficult to get from one end to the other. But like most countries I've traveled within, although it looks easy, it probably is not. My trip from Butha-Buthe to Meg's fellow Peace Corps member's village, Mphaki, was only 159km (about 100 miles) away. But by roadway, it was close to 200km (124 miles). I left Butha-Buthe at 9am, and I arrived in Mphaki, after taking eight various vehicles of transportation, by 11:30pm. Now, my calculations are skewed as an aforementioned car accident I was involved in (which will be another Travelog Thursday special) delayed my trip for many hours, but even so, my day was long. I arrived at this stranger's home as she had stayed up for more than two hours in her dark and cold rondoval (a small round hut with no electricity) waiting for the arrival of a friend of her friend's. But not only did she welcome me to her home, but had to graciously greet me in a terrible state following the car accident. I was nearly hypothermic from being in the cold for hours and with potentially broken ribs. My new house mother, Gwen, took care of me like a proper Basotho woman would. But she's actually from Pennsylvania. Immediately as I slowly stumbled into her small yet comfortable “hut” she offered up some delicious bread and soup since I had not eaten the entire day. This was one of my first true treats of customary pleasures and it could not have come at a better time. Our introduction rivals for one of the most interesting in my travels as not only did I travel across the country to be hosted by someone I had only heard stories of, but I also needed to be nursed back to health by this new savior in sweatpants. Humorously, we laughed at the fact that my first present given to me in Lesotho was my new Basotho name, which was given to me no less than 30 hours prior. My new name was Tuso meaning “help” is the Sesotho language. When I was given the name, I wondered why my now “mme”(mother) felt I should be named “help” as I did not think I was being of any assistance to the country or family, just a wandering traveler. But as I realized the next day, under the care of Gwen, I was actually the one needing the help. That night I struggled to sleep as my entire body was sore but pure exhaustion got the best of my pain. I woke up to glaring sunlight and a small present of joy standing in the front of the room. The hut's door was wide open and sunlight was overflowing the inside, bouncing off the round walls and creating a burst of bright light. After my eyes adjusted to the shine, I finally made out what was standing in the room, staring at me. As I gingerly sat up in bed, the object I saw was a young boy with zero expression on his face, his mouth slightly open to see his generously spaced --yet dirty-- teeth, and a bright red hooded sweatshirt on. The whites of his big, bright eyes contrasted strongly against his dark skin, especially with his hood on casting an even darker silhouette. We examined each other carefully as I was still a bit dazed from my heavy sleep. I finally decided to say “hi” and very subtly he smirked at the sound of my voice. Gwen often let the children of the village come to her house and color from her coloring books, so he was surprised to see me. As this little one slowly crept closer to me to grab his Crayons and paper which sat beside me on the shelf, his smile became increasingly wider until he was ear-to-ear smiling once he reached the shelf. He giggled and immediately sprinted out of the rondoval. His antics made me laugh but unfortunately that gave me a shockingly quick reminder of how painful my ribs were with every chuckle. Over the next few days, I got to know this regular visitor as he came to the hut around the same time. Each day he came in, received some bread or snack which Gwen had made, and stuck around with us. 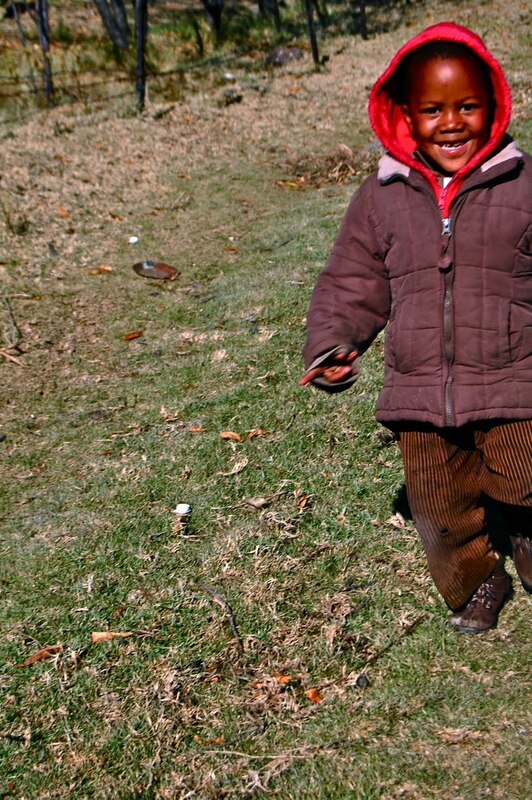 He did not speak English, was only about four years old, wore the same red-hooded sweatshirt, and found the uttermost enjoyment out of me and my camera. Finally, I learned his name on day three. Ke Keletso. A strong name for such a little man. Every time I saw him, he brought a bit of light into the house. His presence was quiet, never speaking unless spoken to, and even then it was a faint, one or two words. But he made up for it with his big smile. He wandered around the house looking at things, taking photos with my camera, and sitting at the dinner table just enjoying himself. He had a great demeanor that was peaceful, youthful yet mature and wise. He never raised his voice and he was very even keeled. He hung around sometimes with his friend who was a bit younger than him. I don't recall his name but his face I will never forget. He had a very round, bald head that looked too heavy for his body, big puffy lips and a befuddled look on his sore-covered face. 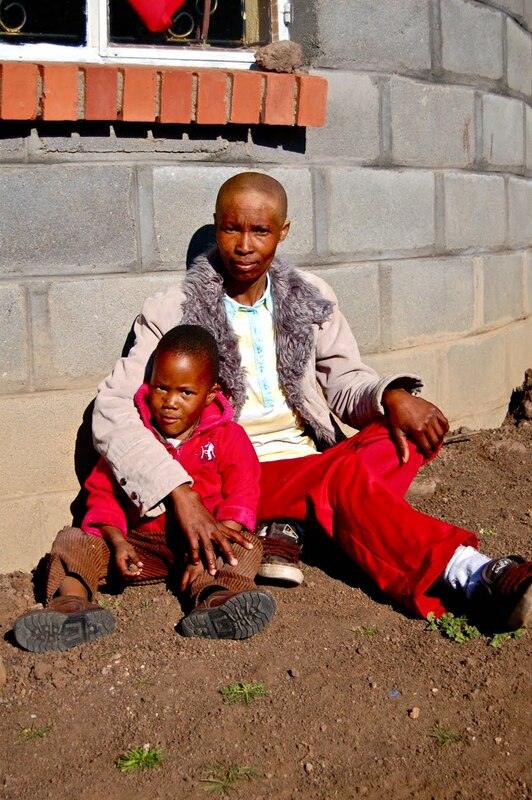 Gwen told me she believed that he was born with HIV/AIDS and that was the cause of his sores. With nearly 1 and every 3 people having HIV/AIDS in the countryside of Lesotho, this was a common occurrence, as well as topic of discussion between the town's people. Life and death was something the entire country has grown very accustomed to and unfortunately a lot of it is centered around the disease that distinguishes their continent so terribly. Lesotho and South Africa are two countries with a very strong prevalence of HIV/AIDS; Lesotho has the highest infection rate per capita in the world, while South Africa has the highest number of people infected in total within one country. 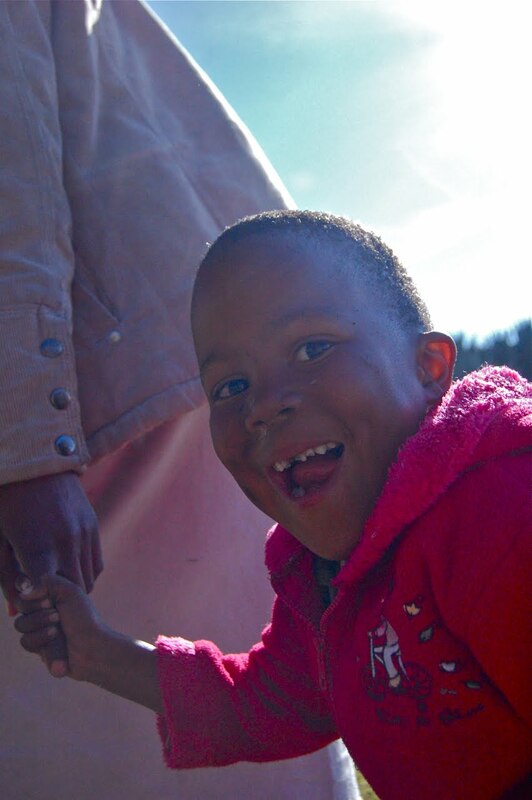 Ke Keletso's personality contrasted drastically with his friend's, but it seemed like they enjoyed each other's company as they played outside. 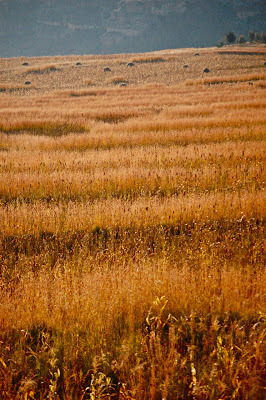 Each day went on and I continued to get closer to Ke Keletso and the rest of the village of Mphaki. People started to understand who I was, although the misconception of being Gwen's husband-- since we slept under the same roof -- became quite annoying as I continued to have to correct them that this new friend of mine was not my wife. On the day before leaving Mphaki, I went to walk down to the main road to take some photos and get some delicious “Russians”, which closely resembled kielbasa. 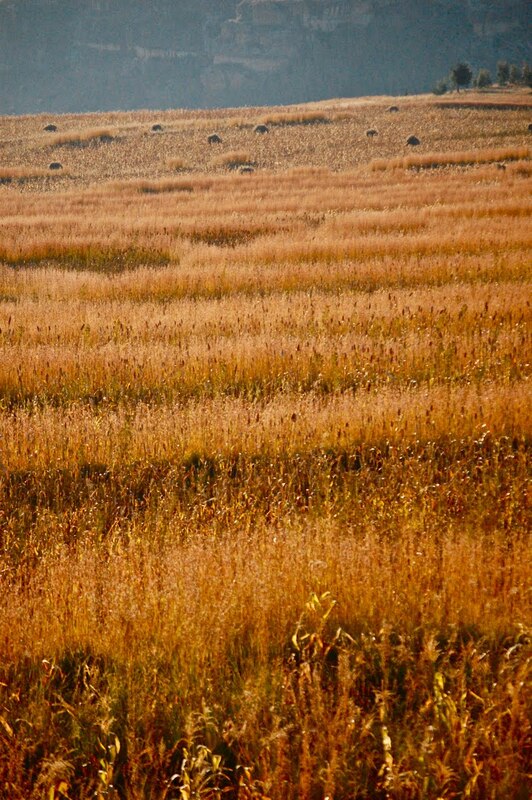 As I was walking back to the house, which sat atop a hill, I looked passed Gwen's hut to where Ke Keletso lived. The sun was going down so it was glaring into my eyes just over the horizon. I got to the bottom of the hill to start walking up and I saw a small figure faintly form in the sunlight as it moved quickly toward me. I was frightened at first because I could not make out what was coming toward me, but the figure looked as if it were floating down the side of the hill, with no footsteps or warning cries. 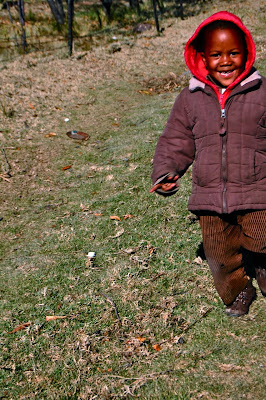 Once the figure reached below the hills' shadows and into view, I saw Ke Keletso sprinting toward me with the biggest smile on his face. I laughed and took a quick photo of how precious he was, and then put my camera down as he jumped into my arms. Just like the first day I met him, his presence made me happy. Although sided with pain in my ribs, having my new friend give me a big hug out of no where once again made all my pains go away. His sudden urgency to run and give me a hug was confusing. It was very out of his shy nature. But after thinking about it further, perhaps he thought I was leaving since I was at the main road where most people stand to hitch the next car going through town. Perhaps he felt that it was the last time he would see me, and sadly actually, it was. I woke up the next day to snow falling on the sandstone colored earth. It was terribly cold outside and Gwen's “mme” came to say goodbye to me and friends Erica, Victor, and Albert who stayed with us for a few nights to keep company. Before we left, Gwen asked her mme a question for me: what does Ke Keletso's name actually mean in Basotho?” Gwen's mme replied, “another present. He is the third and youngest child of the family, so he is the family's gift.” Again. 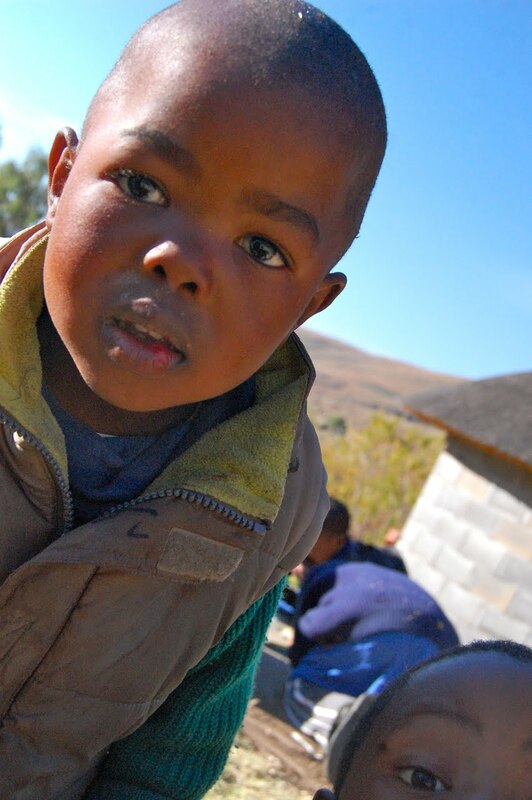 It was only fitting that learning my Basotho name was my first gift within the country, and that a young boy with zero verbal interaction with me but just simply a bond could be another present for me to receive while in Lesotho. ...Spread some love on this Valentine's Day. Today is the holiday of Valentine's Day and what better way to celebrate than to post a few photos on love and call it a day? Since the day just began, my overwhelming emotions of love and happiness are still in the lighter stages. But later today or tomorrow, I will produce my thoughts on my motto, "Peace, Love and Photography" and introduce one of my portfolios under the same title. Scraped graffiti along side a stone at Cambodia's ancient temple, Angkor Wat, establishes the universal word of Valentine's Day: love. 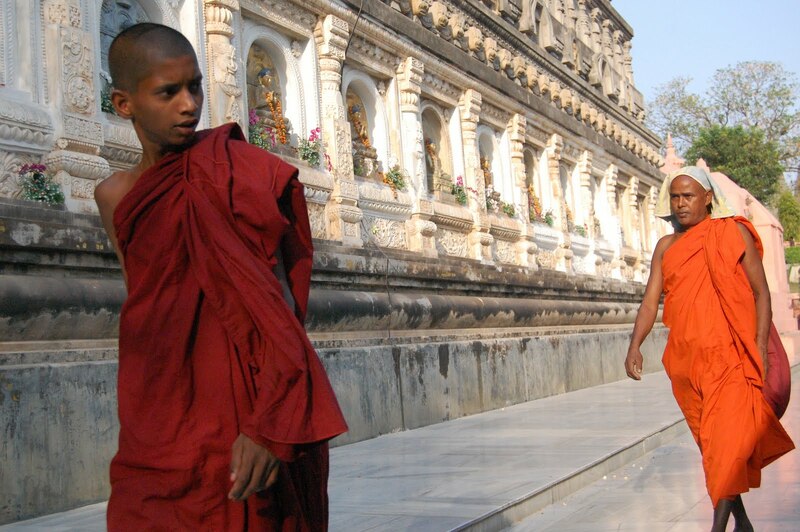 Bodhgaya, India ~ Travelog Thursday premiere! 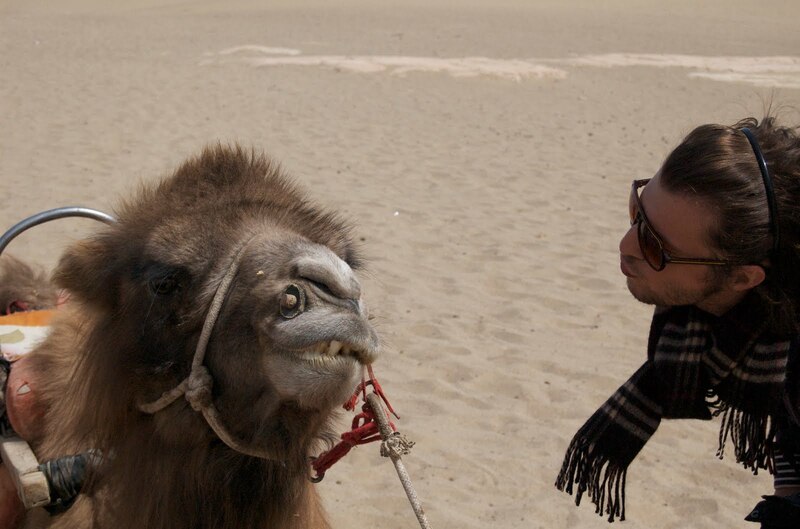 Every Thursday I will be posting short stories about my travels and adventures and post photos to support them. 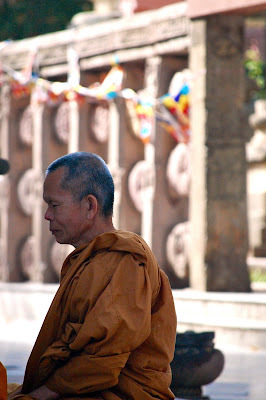 This week's Travelog is from one of the holiest (if not, the most) places in Buddhism, Bodhgaya, India. The other day I was driving through Pennsylvania after a icy storm hit the area. The road conditions were fine but on both sides of the road were beautiful images of rolling hills covered in shear ice with a lonely, leafless tree sitting in the distance atop the hill. Seeing it through the fog hovering over the open fields was almost eerie but still calming. Those multiple scenes continued to stick in my mind miles further down the road. I kept thinking to myself, “I should have stopped and taken a photo of that scene.” I even was angry at a car pulling off to the side of the road whom I believed was “stealing my photo!” My sense of entitlement might seem a bit egregious but I struggle with the idea of a photo or scene not being captured the first time. Once getting home, I thought of other times in my travels where I saw a scene that would have been a spectacular photograph, but missed it. I was going to write about such stories, but realized it would only frustrate me more. I pondered on the many times where I caught myself saying, “man, I missed a great photograph there.” But then recalled that many times, I did actually return to the scene with my camera in hand and got the photo I was looking for. 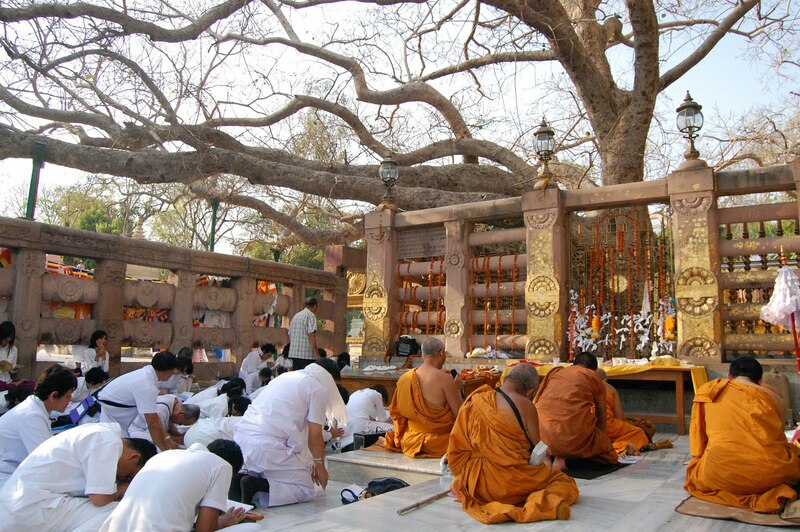 Below, you'll see a photo I took at the Bodhi Tree (Tree of Enlightenment) in Bodhgaya, India. 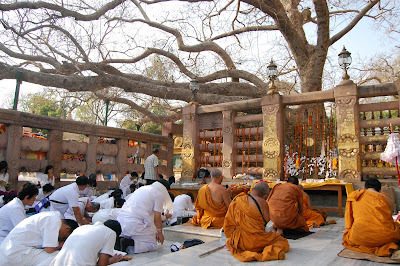 The actual tree and place in which the Buddha reached Enlightenment after meditating underneath this tree for nearly seven weeks. This is the holiest of sites in Buddhism, as this is the place Buddhism began. My time in Bodhgaya was one of many emotions. It was my first time seeing my friends whom I left in Varnassi two weeks prior to set out on traveling by myself. Solo traveling in India is not the easiest venture and it resulted in some truly difficult and frustrating times, but also very memorable moments as well. So upon my arrival, I somehow found my friends after staying awake for nearly 25 hours traveling and shared stories over some palak paneer. It was comforting to not have my guard up the entire meal and simply relax a bit with close friends. The restaurant we were at was very interesting. The entire menu gave two set prices; “cheap price” and “caring price”. 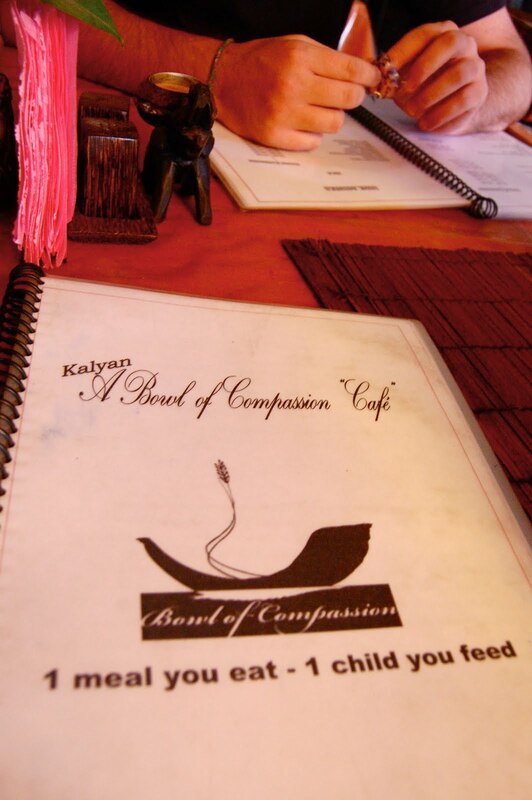 The idea was you received the same meal but the caring price gave the additional rupees you paid toward a local charity and/or paid for the same meal to be served to a starving child. I obviously chose the caring price and had myself a fairly tasty meal. Unfortunately, I had to say goodbye to my friends once again as they were off to their next city and I was about to head to one of the most amazing places in the world, Mahabodhi Stupa where the holy Bodhi Tree sits. As I got to the entrance I was completely in awe of the massive stupa and the tree beside it. I actually was beside myself. And sadly, my stomach seemed to be just beside itself as well. I walked around the stupa snapping hundreds of photos and praying, all the while my stomach began to tie itself in a knot. The “caring” meal did not live up to its name. I slowly contemplated heading back to my hotel room as my stomach was killing me. So I decided to pack up my camera and see if I could wait it out. After resting a bit longer, I needed to leave the stupa for the day and rest up. Here is when I saw a photograph that I had to have. It was one of the very last leaves left on the Bodhi tree as the rest had fallen down for the season, wrinkled and brown. But this leaf sat against a blue sky with pink and red shades, completely unaware of its surroundings all falling toward the Earth. I had to get this photo, especially as it was a timely photo. The urgency in it was extreme because if I missed it today, who knows if it would be there tomorrow but with my camera already packed in my bag and my mission to head back to my hotel, I decided to ignore it. As I walked passed the fruit vendors with hundreds of flies around each basket on my way home and the random fires kicking up smoke and dust from the unpaved roads, I began thinking to myself, “If I take my camera out now, my point of ignoring that photo of the leaf at the stupa is meaningless.” Well, the brief seconds it took to simply pull my camera out and snap some photos did not hinder the status of my stomach bug but rather fueled my anger in leaving the photo "back at the alter" per se. I stopped to get some random medicine at the shop near the hotel and finally got to my hot and sticky room to lay in my bed and turn the television on. Without too much detail, my peaceful time was constantly interrupted by bathroom visits and cold sweats. Once my fourth round passed and last roll of toilet paper expired, I tried to get some sleep. I turned off my lights and closed my eyes until I had a little visitor, and it wasn't an evil stomach. As I was sleeping, a small mouse had somehow hopped onto my bare chest, then onto my head and back into the darkness. I sprang out of bed, flipped the lights on to see where the rodent went and saw him on the window seal as he stared back at my near naked body. I had no idea what I was going to do with him, and by this time, it was far too late to ask anyone for help to rid this creature out of my room (plus the smell coming from my bathroom was something I did not want anyone else to have to endure). So I scared the little mouse into a corner, but it escaped all of my traps, even hopping back onto my sheets and pulling a Jason Bourne by jumping from the bed in the air and onto the window curtain, sliding down it vertically onto the floor. I am not joking. After about 45 minutes of frantically running around my room in my underwear to get this mouse out of my room I finally got it to scamper out underneath the door, where I toweled the bottom of the door on both sides so he couldn't come back in. I finally got to sleep with the mouse out of my mind, but then that photo that I missed began to fill the void. For the rest of the night I thought about how I would shoot the scene if it was still possible. Super Bowl predictions and new photos! Since I've been recently labeled as being scarily addicted to sports (and sports wagers), I am putting out just one post with my Super Bowl XLV comments but also include some new photos that I just uploaded to WMT Photo for your viewing pleasure. 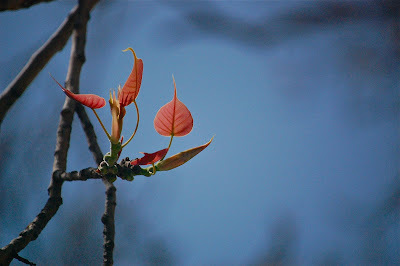 First off, today, I uploaded another new gallery of photos on my Nepal page. Stories behind these photos will be given on this blog but also throughout the website, but for now, my mission is to get as many good, professional photos up asap. So take a look! Now since I've posted the link and a photo from the newly made gallery, I must give an explanation to my rebirth into American sports fandom before my prediction for Sunday's game. Living in a foreign country for two years, I did not have the great pleasure of watching any of my favorite sports teams (aside from Chelsea in the English Premier League) and so my love of the Patriots, Celtics, Red Sox, UNC Tar Heels, and Oregon Ducks sort of fell by the wayside with my time difference of 11 (or 12) hours killing any opportunity to watch my teams. So now that I am back in America, I am simply making up for lost time. I will even out to being a normal person once again, but for now, I am on overload. Ok, so the Packers will take home the Lombardi trophy back to Green Bay where that specific trophy got its name. I don't feel like seeing the Steelers and Big Ben's felon hands touch that trophy again. Let Aaron Rodgers enjoy the feeling since he was cast in the shadow of Bret Favre's massive ego. The Green and Yellow will represent champions much better than the boys from the Steel City. Enjoy your seven layered dips, buffalo wings, and hopefully hysterical commercials on this Sunday of Super proportions. After only a 1.5 year hiatus, I am back to blogging. Please be patient with this blog, but now I promise you my next post will not take me 1.5 years to publish. I plan to update this blog often with stories and new photographs as much as possible. So to give you an idea of what I have been doing as of lately, please head over to my website W Michael Tirone Photography and look at my new photos and writings. I am updating the site with photos from over the past three years (out of the 75,000+ that I have taken). If my website brought you here, than it looks like you've been wondering around, and that's good! I hope you like everything and please comment or contact me about anything (ie- feedback, inquiries for freelance work, framed/prints of my photographs, etc).